If you’re looking for a long, relatively flat off-road waterfront run, then the area from Danube Dam heading south toward Budapest is for you. The multi-use paths that stretch along the Danube south of the city have long been a favored cycling route, and are also a favored running spot. Given the length, and the various ‘tributary’ paths, it’s impossible to map out a specific route — best to choose a section and length. We’ve imported a publicly available route map that heads from the SNP Bridge in central Bratislava, south for 160 km to Esztergom, Hungary. For those in Bratislava, a good place to start is in Petržalka, off Kultikuva or near the dam itself (Petržalská hrádza), and do the waterfront paths heading toward the Gabčíkovo water dam. There are separate road and dedicated gravel paths in some sections. 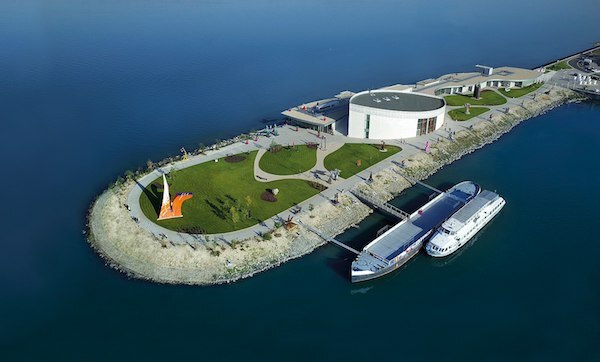 One particularly special section is to start at Danubiana, a modern art museum with a spectacular setting on a peninsula, and enjoy the many km of paths around there. We note that although the setting is spectacular, the scenery can get a bit monotonous after a time. Also, this is very open running — so it’s exposed if hot, windy, icy, or cold. And there aren’t facilities for many stretches. As many km as you like!